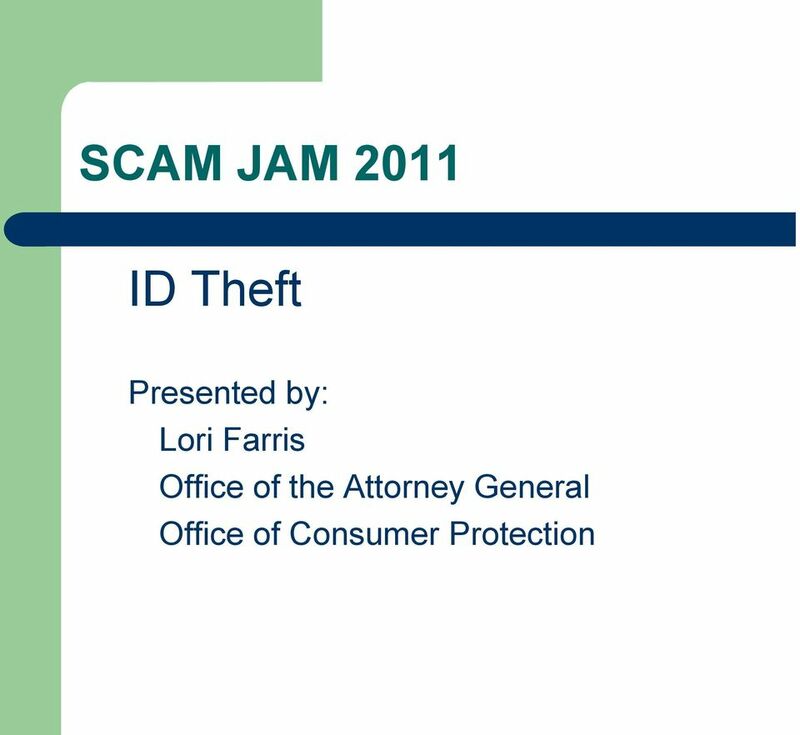 Download "SCAM JAM 2011. ID Theft. Presented by: Lori Farris Office of the Attorney General Office of Consumer Protection"
2 ID Theft The NAME GAME. Don t Get Played! 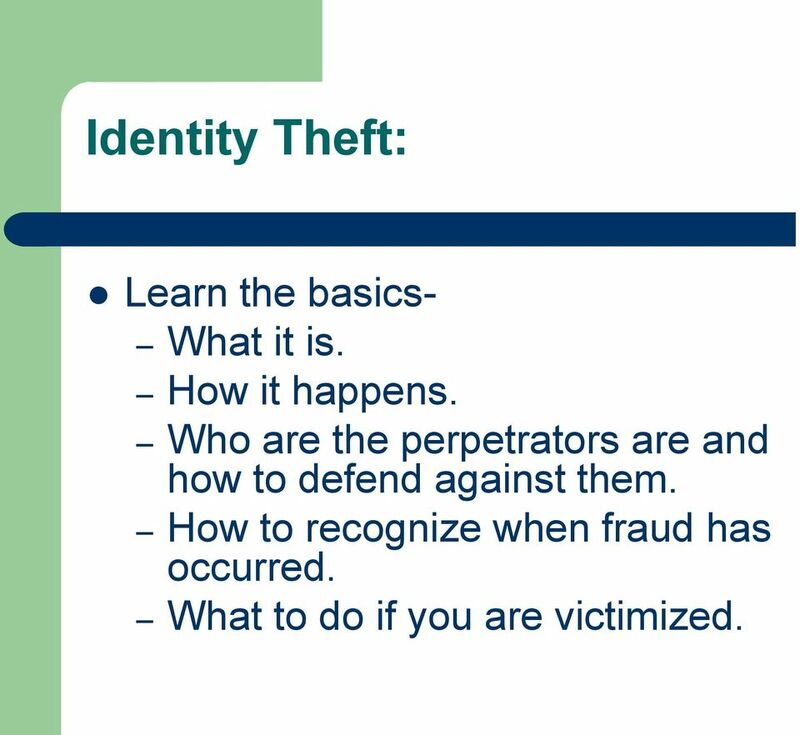 3 Identity Theft: Learn the basics- What it is. How it happens. Who are the perpetrators are and how to defend against them. How to recognize when fraud has occurred. What to do if you are victimized. 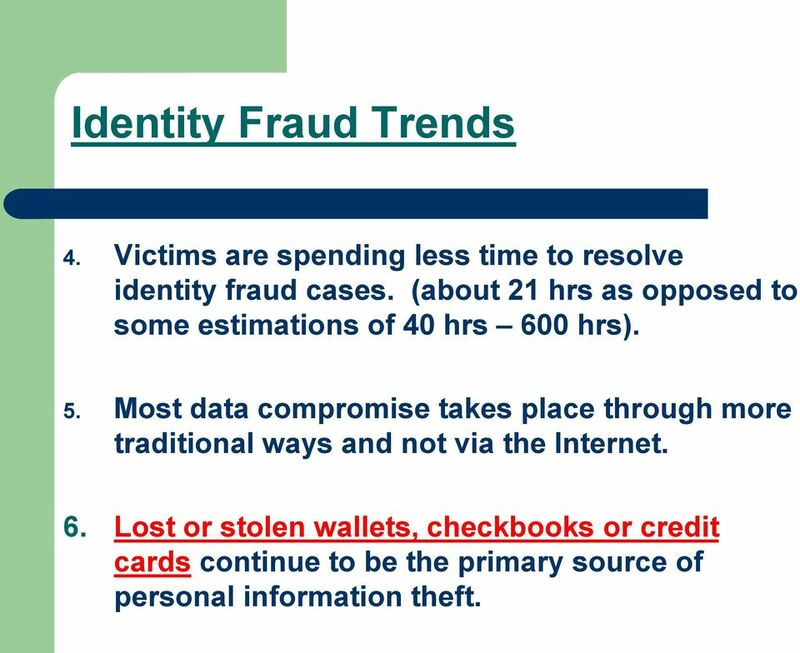 5 Identity Fraud Trends 1. Just recently, the number of adult victims has increased 12%, and still continues to be the fastest growing crime in the nation. (FTC estimates 1 in 4 people will become victimized at some point). 2. The average fraud amount per case has increased and costs a total of $54 billion annually. 3. An average victim can expect to see over $6,000 illegally charged in their name. The average cost to the individual is $373 to clear his name. 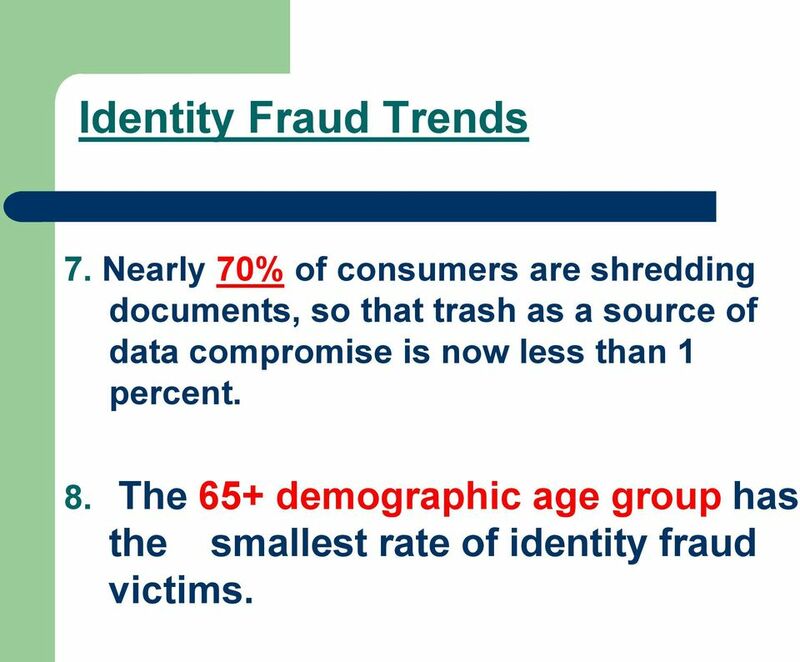 6 Identity Fraud Trends 4. 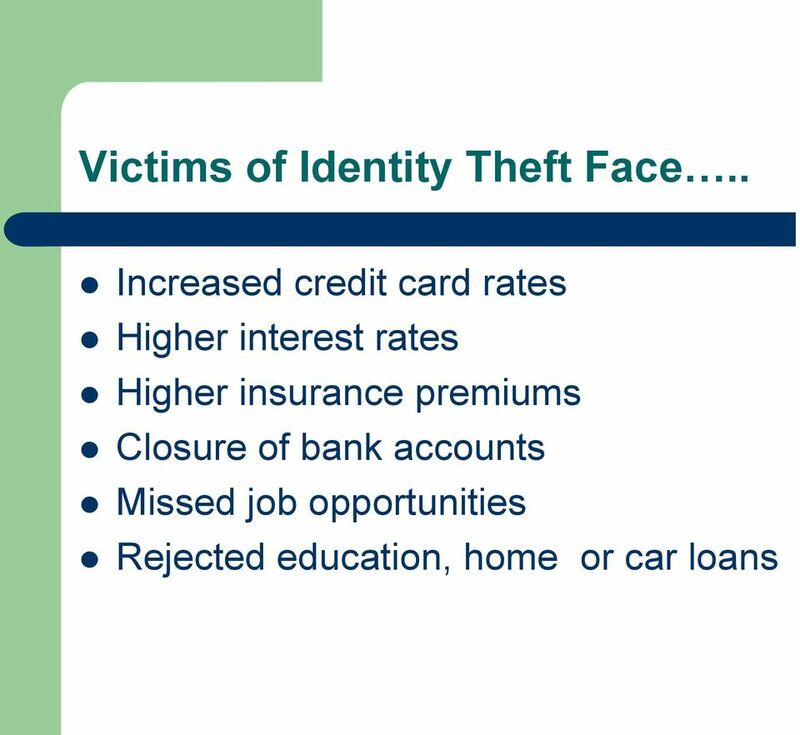 Victims are spending less time to resolve identity fraud cases. (about 21 hrs as opposed to some estimations of 40 hrs 600 hrs). 5. Most data compromise takes place through more traditional ways and not via the Internet. 6. 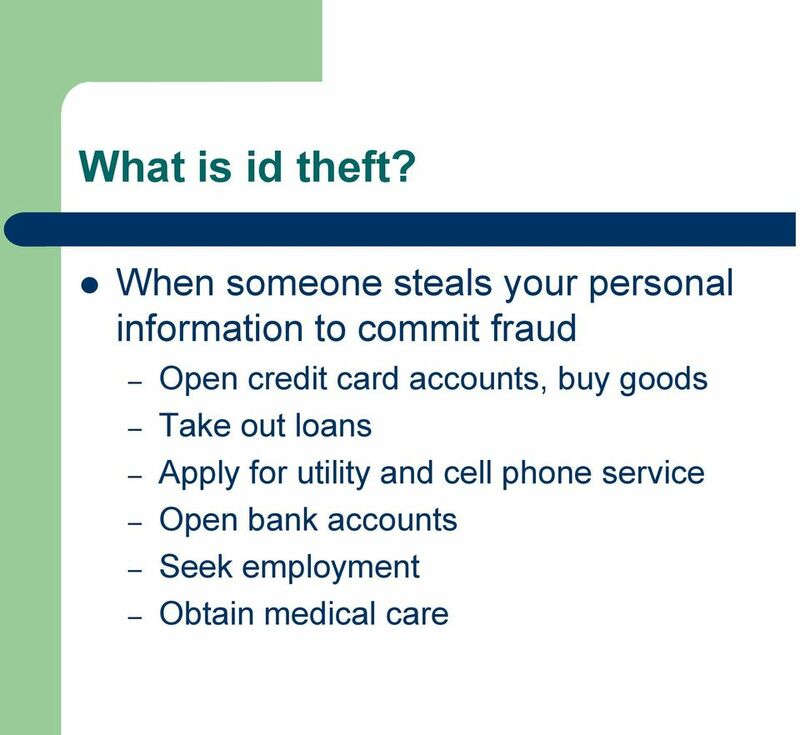 Lost or stolen wallets, checkbooks or credit cards continue to be the primary source of personal information theft. 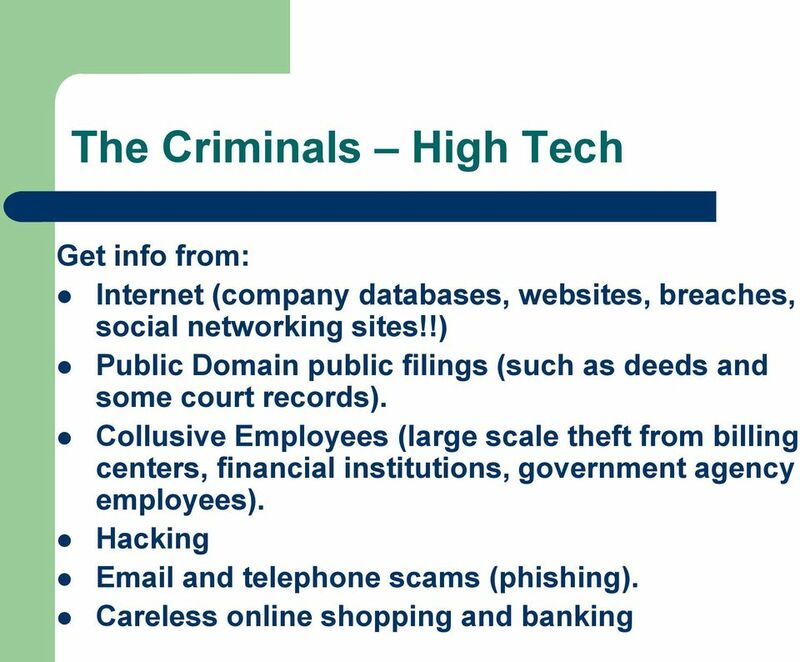 7 Identity Fraud Trends 7. 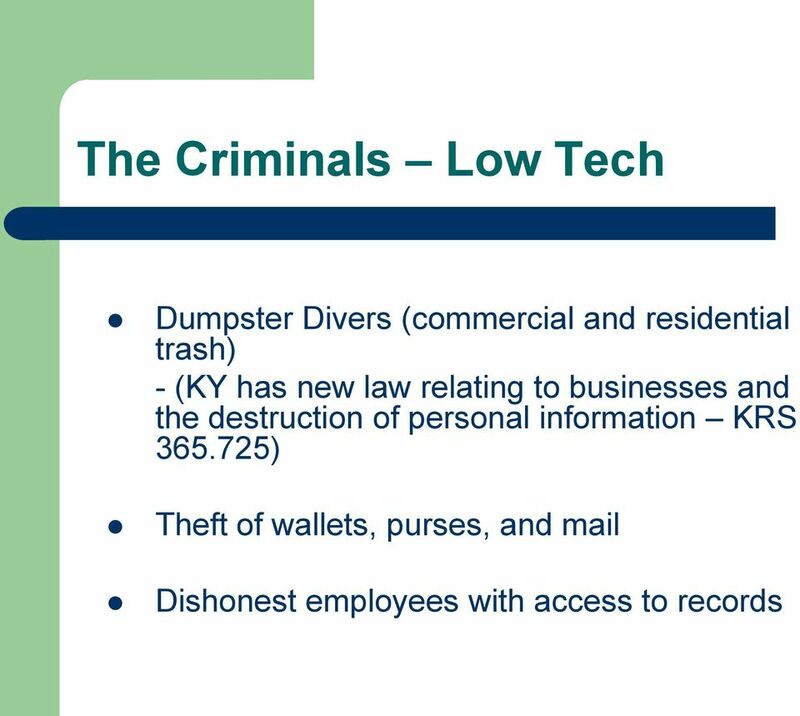 Nearly 70% of consumers are shredding documents, so that trash as a source of data compromise is now less than 1 percent. 8. 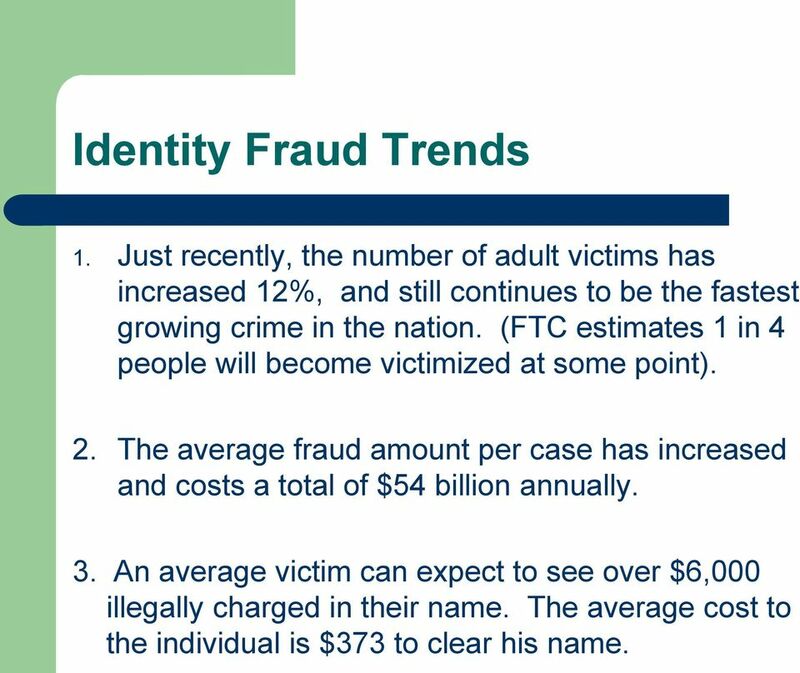 The 65+ demographic age group has the smallest rate of identity fraud victims. 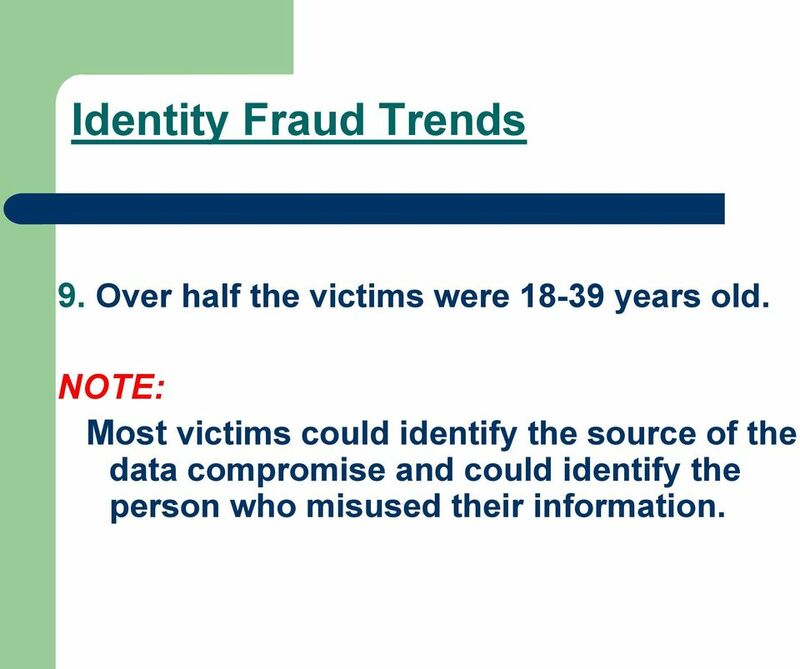 8 Identity Fraud Trends 9. Over half the victims were years old. NOTE: Most victims could identify the source of the data compromise and could identify the person who misused their information. 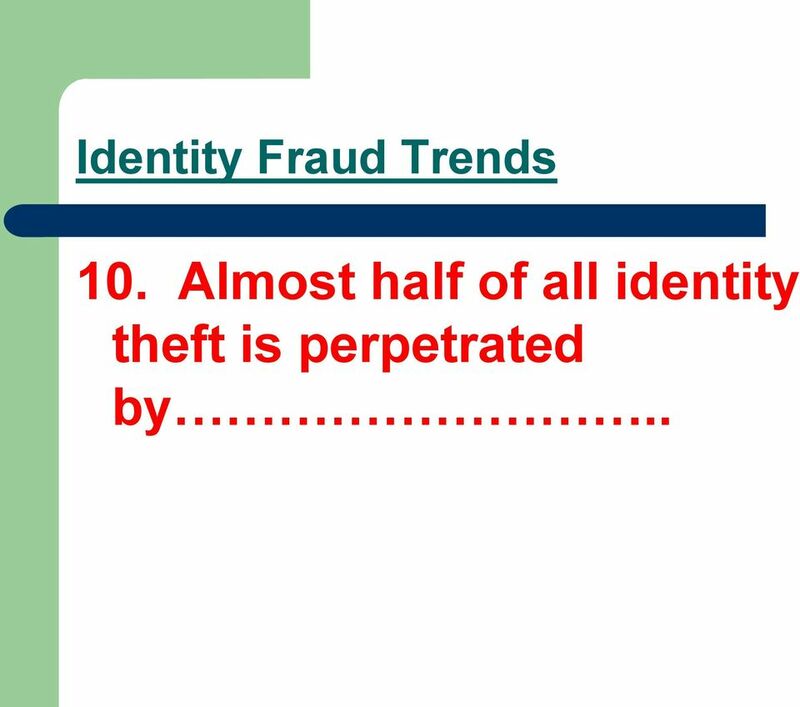 9 Identity Fraud Trends 10. 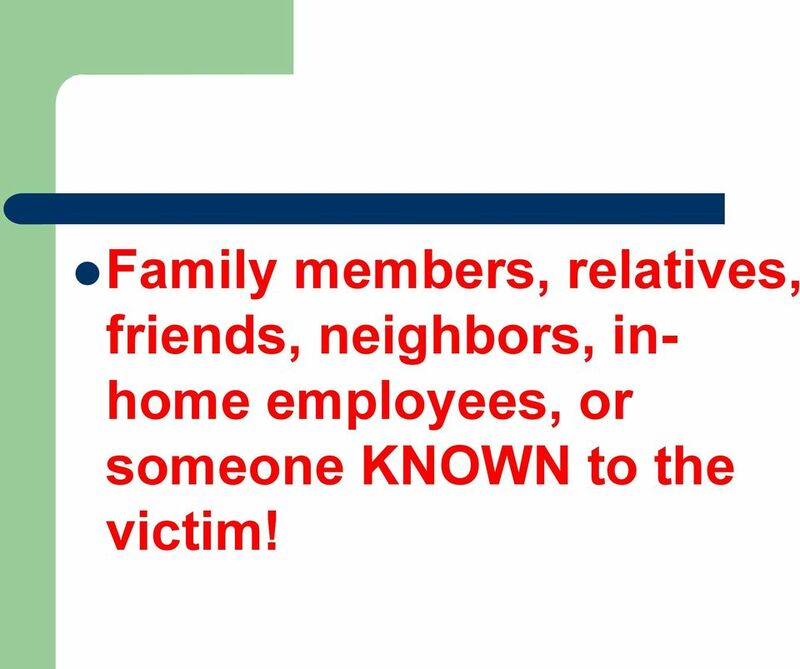 Almost half of all identity theft is perpetrated by..
10 Family members, relatives, friends, neighbors, inhome employees, or someone KNOWN to the victim! 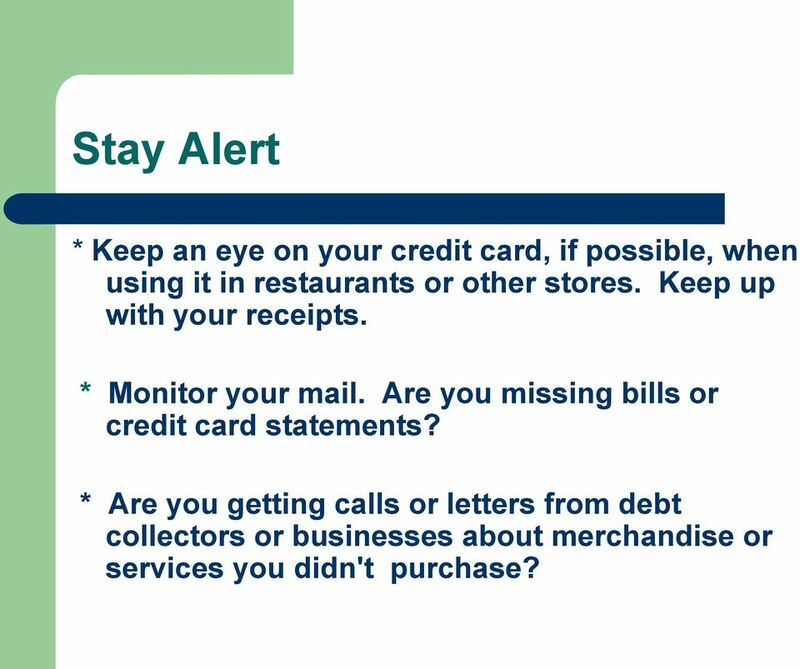 14 Stay Alert * Keep an eye on your credit card, if possible, when using it in restaurants or other stores. Keep up with your receipts. * Monitor your mail. Are you missing bills or credit card statements? * Are you getting calls or letters from debt collectors or businesses about merchandise or services you didn't purchase? 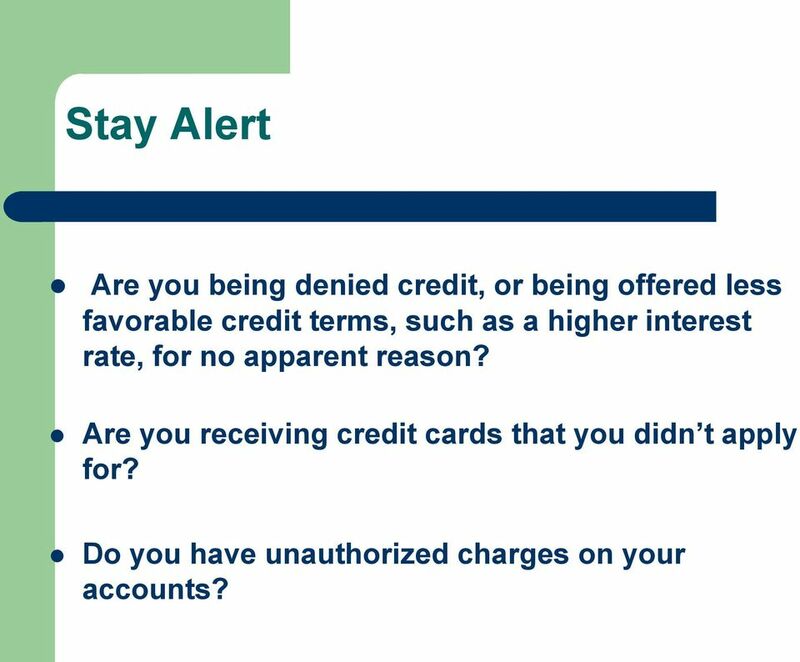 15 Stay Alert Are you being denied credit, or being offered less favorable credit terms, such as a higher interest rate, for no apparent reason? Are you receiving credit cards that you didn t apply for? Do you have unauthorized charges on your accounts? 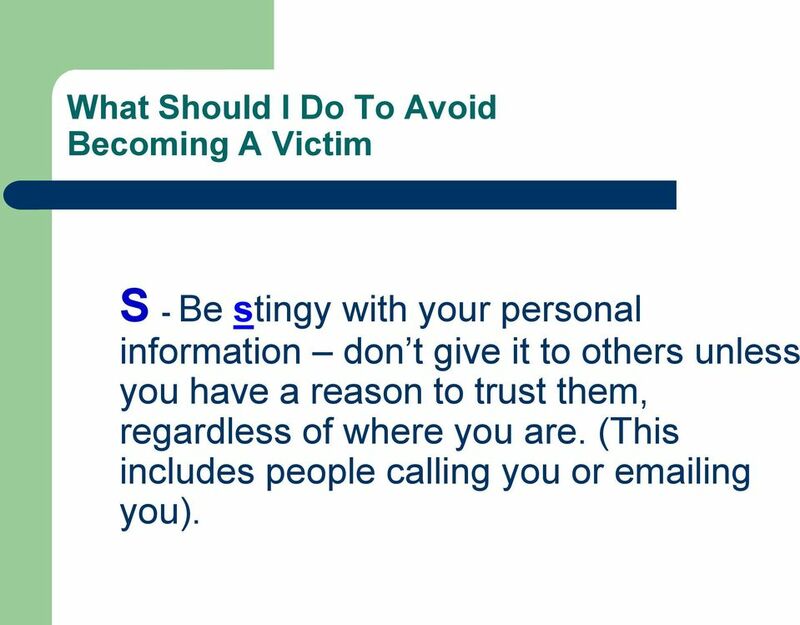 17 What Should I Do To Avoid Becoming A Victim S - Be stingy with your personal information don t give it to others unless you have a reason to trust them, regardless of where you are. (This includes people calling you or ing you). 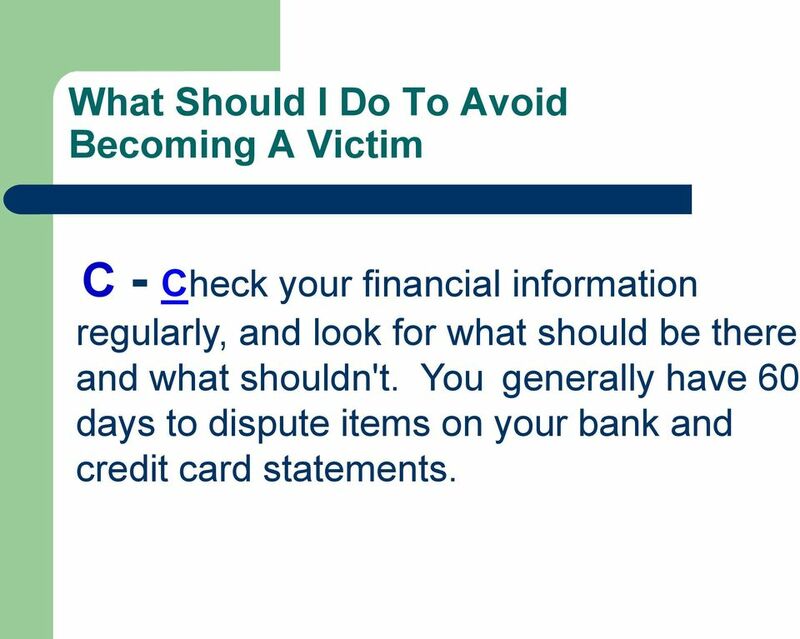 18 What Should I Do To Avoid Becoming A Victim C - Check your financial information regularly, and look for what should be there and what shouldn't. You generally have 60 days to dispute items on your bank and credit card statements. 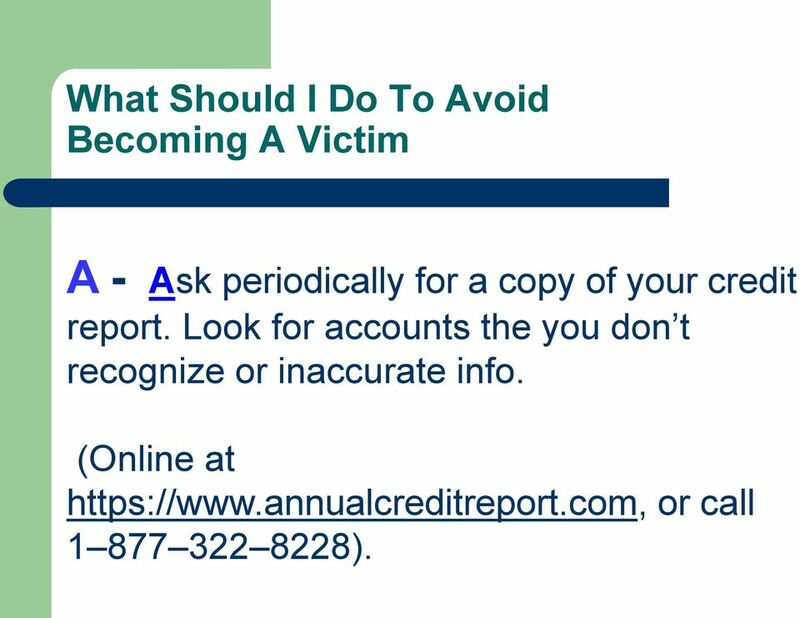 19 What Should I Do To Avoid Becoming A Victim A - Ask periodically for a copy of your credit report. Look for accounts the you don t recognize or inaccurate info. (Online at or call ). 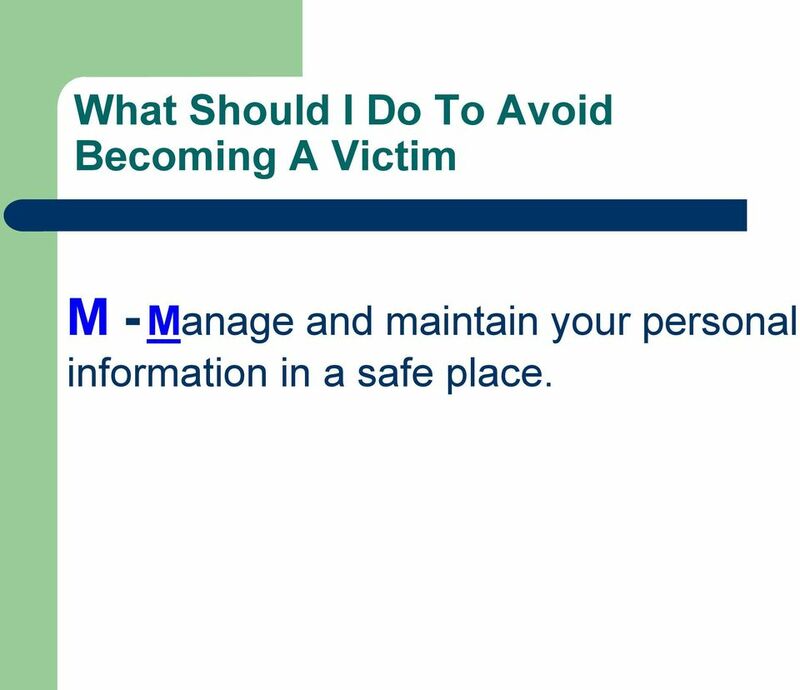 20 What Should I Do To Avoid Becoming A Victim M - Manage and maintain your personal information in a safe place. 21 When Should I Reveal My SSN? Note: Not every request for your SSN is an attempt to steal your identity, but not every request is mandatory. In general, you will need to provide your SSN to: Employers for wage and tax reporting purposes. Financial institutions, banks, card issuers, etc. Landlords or utility providers. Government agencies. Credit reporting agencies. 22 If Asked for Your SSN Be sure to ask questions to help you decide whether to reveal it: Why do you need my SSN? Will you accept a different form of id? How will you use my SSN? How will you protect my SSN? What will happen if I don t provide my SSN? 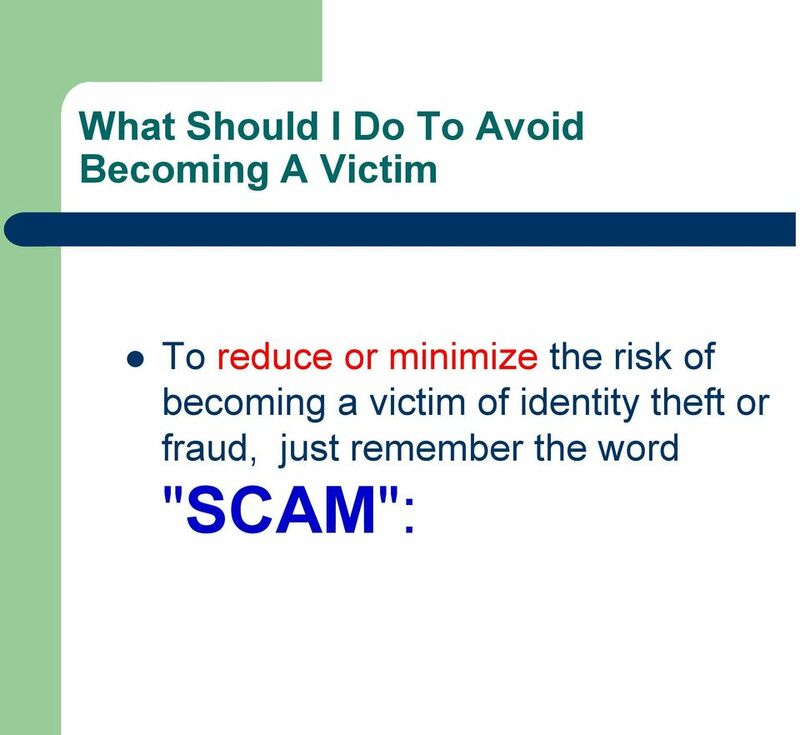 24 What Should I Do If I've Become A Victim Get an ID Theft Victims Kit. (Call the Kentucky Attorney General s Office at , or get it online at Report the incident to law enforcement. (Your local police department or the Kentucky State Police.) Keep records. 27 What Should I Do If I've Become A Victim Consider putting a security freeze on your credit report with each credit bureau. Your credit report will not be shared with others, such as potential creditors, without your authorization. Cost: $10 each time you place, lift or remove a freeze. 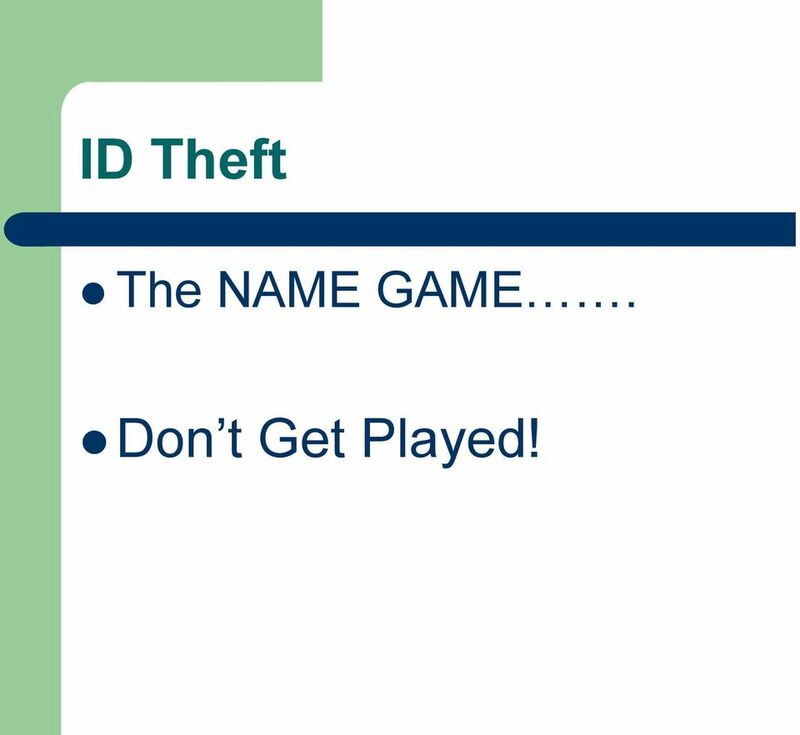 No charge for id theft victims who provide a valid police report. 28 What Should I Do If I've Become A Victim Opt out of receiving pre-screened or pre-approved credit offers. Prohibits credit bureaus from selling your name for marketing purposes. or OPT-OUT. Good for 5 yrs. or you can make it permanent. 30 What Should I Do If I've Become A Victim Follow up in writing with all contacts you have made send mail certified, return receipt requested. Keep copies of all correspondence. Keep old files even if you believe your problem is resolved. 31 ID THEFT No one is Immune!! But we are NOT POWERLESS! !